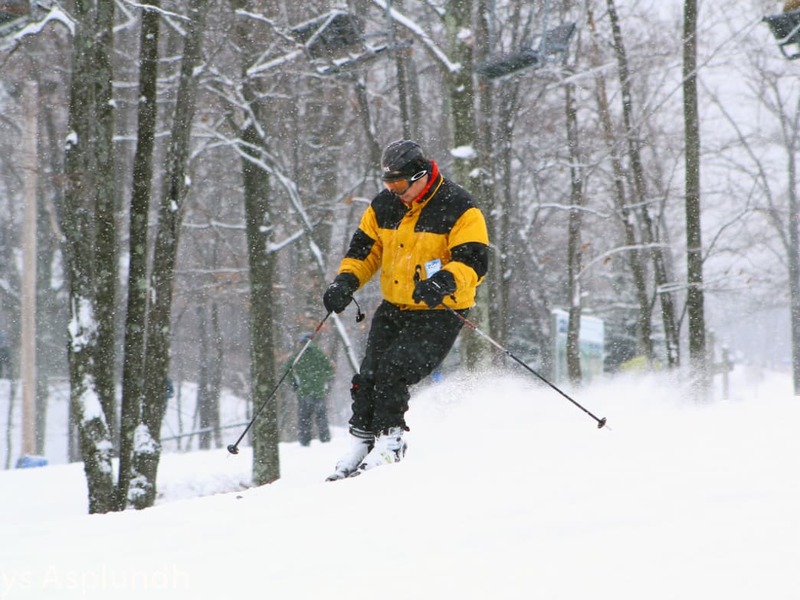 Visitors have enjoyed skiing in the Poconos since the 1940s. Rhys A. Today, the Pennsylvania Pocono Mountains are known as one of the top ski destinations on the East Coast as well as a scenic outdoor escape any time of the year. But the area was first famous for something very different: Following World War II, GI’s brought their new wives to the Poconos in droves, granting the region the nickname, "Honeymoon Capital of the World." Over the last 70-plus years, the Poconos have evolved from a convenient getaway for couples to an outdoor destination, due in large part to the growth of the ski industry in the region. In 1946, Big Boulder opened and became Pennsylvania’s first commercial ski area. A snowmaking device was patented here in 1950, and by 1956 the system was up and running, covering the slopes with abundant snow. This became the first commercial use of snowmaking, and today it is an essential part of keeping Poconos ski resorts open all season. With the completion of Interstate 80 in the 1950s, the region gained easier access to major metropolitan areas, fueling its popularity among honeymooners and skiers alike. By 1960, the Poconos rivaled Niagara Falls as the country’s most popular honeymoon destination, and resorts rose to the occasion by building heart-shaped tubs at luxurious couples-only resorts. Some resorts even boasted their own ski hills. 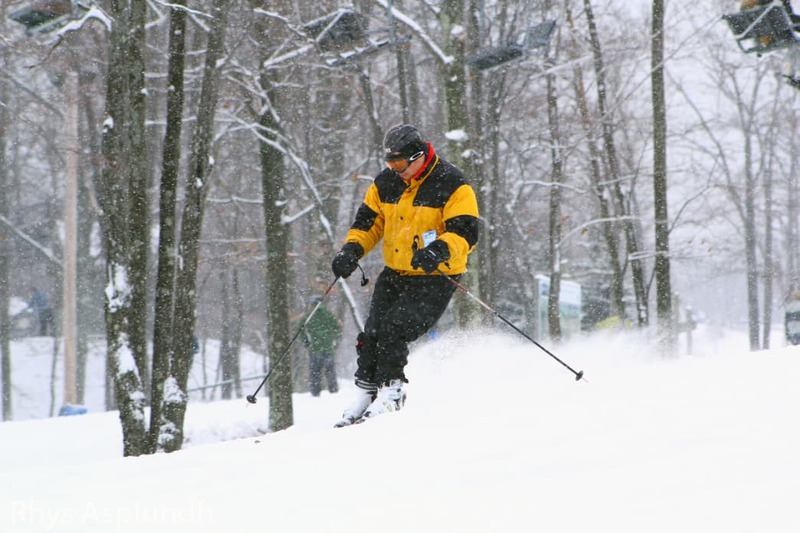 Around the same time, a second ski resort, Camelback Mountain Resort, opened in the region with 14 trails and three lifts that served 41,656 skiers. Today, by comparison, Camelback serves nearly a million skiers and outdoor recreationists annually with 34 trails and 16 lifts. Jack Frost joined the scene in 1972—created by the same owners as Big Boulder. Original construction plans for this resort included all the slopes, lifts, buildings, and snowmaking infrastructure needed. Jack Frost is now known for its groomers and family-friendly vibe, and operates as a companion resort to Big Boulder. Growth in the Poconos continued strong into the mid ’70s. Developer Karl Hope joined the resort-building action in 1975, adding three trails and two lifts to his timeshare program at Shawnee. The first few weeks it was free to ski because they hadn’t finished building the cashier’s window yet. After the construction was done, tickets were just $6 a day. Shawnee’s humble beginnings meant skiers were treated to free coffee and donuts served from the tailgate of a pickup, and a U-Haul truck served as the rental gear shop. with one double chairlift, one j-bar, and approximately five trails. Today, Ski Big Bear has three conveyor surface lifts, four double chairlifts, 18 trails, and a terrain park. Blue Mountain Resort was opened in 1977 by owner Ray Tuthill. He had purchased acreage on Blue Mountain in the ’60s after falling in love with skiing in New York and realizing he wanted a place to ski closer to home. He transformed the property into a resort (then named the Little Gap Ski Area) with four trails and two lifts. It has now expanded to 39 trails and 16 lifts. By the 1990s the ski industry was the biggest draw to the region. Many honeymoon resorts closed, while more family-friendly accommodations took over, spawning the Poconos rise as a gateway to skiing for the country. People learned to ski in the Poconos and moved onto bigger mountains, helping to grow the ski industry as a whole. 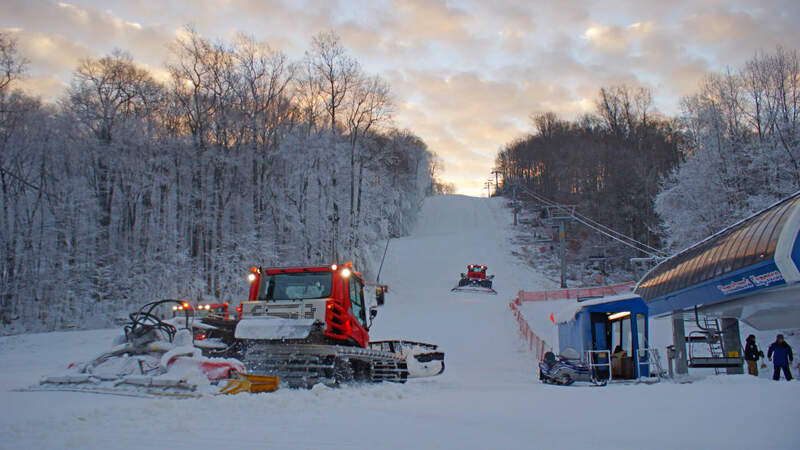 Blue Mountain Resort expanded, adding acreage to create Pennsylvania’s highest vertical drop—1,082 feet. By the late ’90s, snowboarding had become mainstream, and on Presidents’ Day 1997, Blue Mountain lifted its snowboarding ban and gave shredders full access to the entire area. A terrain park for skiers and snowboarders came next in the 1998-99 season. The long-awaited Razors Edge Trail opened in 2003, and it remains one of the region’s most popular Double Black Diamond trails today. The ’90s were a huge growth spurt for Shawnee Mountain as well, thanks to the addition of terrain parks and a new quad lift to the summit. A snow-tubing hill was added in 1997. Tastes continued shifting away from honeymooners and toward the outdoors in the 1990s and 2000s as skiing, whitewater rafting, and golfing flourished. This shift helped establish the Pocono Mountains as a year-round vacation destination. Camelback grew throughout the 2000s, adding the Camelback Lodge and Aquatopia Indoor Waterpark in 2015. It was followed by Kalahari Resorts and Conventions, another family-friendly waterpark resort. Kalahari is the largest waterpark in the eastern U.S., and its transparent roof offers the illusion of being outdoors—even on a cold winter’s day. Camelback also enhanced its popular snow-tubing hill—already the country’s largest at 42 lanes—by adding Galactic Tubing, a nighttime attraction that lights the hills with an LED show. 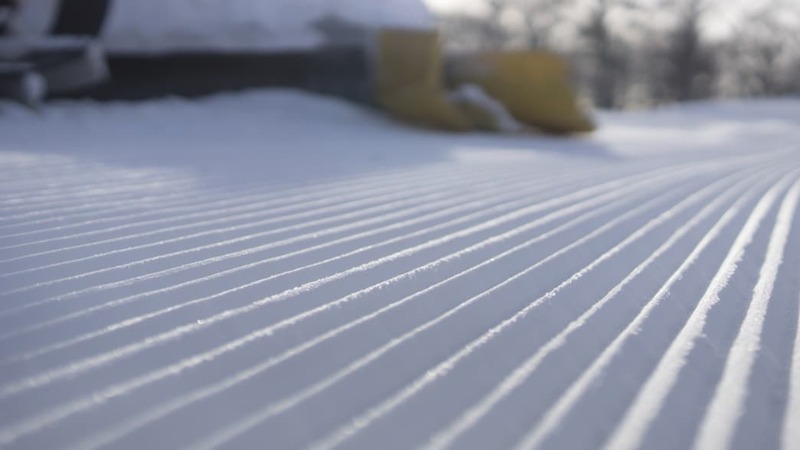 Shawnee Mountain continued growing, too, expanding to 23 slopes, adding state-of-the-art snowmaking and grooming, and building the nation’s largest ski rental shop. 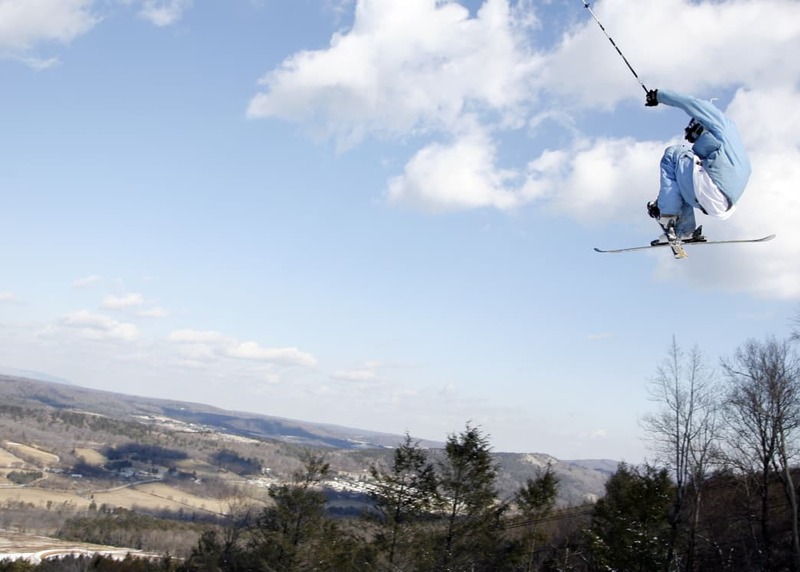 Today, six ski resorts call the Poconos home: Blue Mountain Ski Resort, Camelback Mountain Resort, Jack Frost, Big Boulder, Shawnee Mountain, and Ski Big Bear. Each offers a different ski experience from easy, family-friendly skiing to massive terrain parks paired with advanced terrain. Family skiing now reigns supreme, with 60 percent of visitors coming from New York and north Jersey, and about 30 percent from Philadelphia, the Lehigh Valley, and south Jersey. The resorts continue evolving by adding bigger and better snow-tubing hills and opening summer attractions like waterparks,mountain coasters, mountain-bike trails, and zip lines. Music, food, and drink festivals give skiers more to do in the winter and attract visitors to the slopes in the off season. Sure, you can still visit the Poconos with your sweetheart, but this year-round recreation destination has now become the regional hub for outdoor adventure, no matter what time of the year you visit. Written by Jenny Willden for RootsRated Media in partnership with Pocono Mountains Visitors Bureau.